The human body contains ~100 trillion cells. Only 10% of those cells are human (part of our body). The other 90 trillion are bacteria, viruses, and other microorganisms. Some of these microorganisms play a very important role by helping us to digest our food. 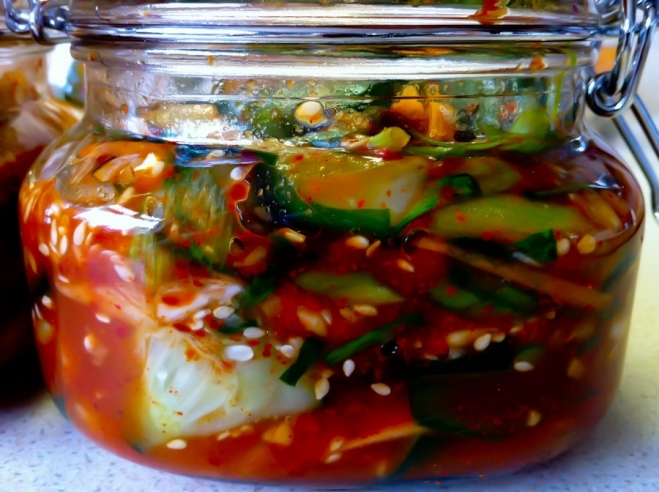 The bowl below contains kimchi that is being fermented in a jar containing a lactic acid bacteria bath (an example of good bacteria). Will Olive Leaf Extract kill off some or all beneficial bacteria/organisms in the digestive tract? Can Olive Leaf Extract be taken at the exact same time as probiotics, or must they be separated by a certain number of hours? If you can offer some clarity in this area it would be much appreciated, thanks! Good question, we get it a lot. No. We have never had a single case of our Olive Leaf Extract killing off beneficial bacteria. Olive Leaves and Olive Oil (very similar phytochemicals) have been a part of our food chain for thousands of years. Our gut bacteria have adapted to foods such as these that may have “anti-microbial” characteristics. If Olive Leaf did kill off the good gut bacteria, we would be receiving reports of customers having diarrhea. Therefore you need not worry about taking probiotics at the same time. If you were to ask the same question of probiotic manufacturers, they might tell you to avoid the olive leaf or take it a couple of hours afterwards or before because they are being very very conservative about this. However, in the 18 years we have been producing the olive leaf, we have not heard of a single customer reporting any sort of problem or difficulty. There are also many bad species of bacteria that are constantly entering our bodies such as this very beautiful specimen of MRSA Staph (photo below). When our body can maintain an abundant supply of colonies of beneficial bacteria, they will compete for space, water and nutrients against the virulent strains which helps to keep them from establishing. Good bacteria in our bodies perform many important functions besides digestion.Were the Olive Leaf Extract to cause a die-off of the good bacteria, particularly the bacteria lining your gut, you would see an immediate reaction with a case of diarrhea. We have never had a report of this occurring or any report of an adverse reaction from anyone taking this product. 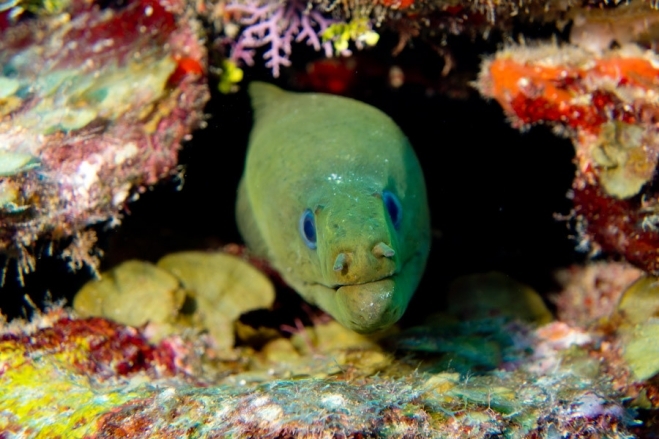 One of my favorite underwater subjects is the the Moray Eel. It may look a little scary and have lots of teeth, but in fact they are very friendly to divers and allow you to approach very close to their hole before trying to scare you away with aggressive behavior. I have been practicing taking Moray Eel shots in advance of a possible trip to photograph Anacondas. The risk is really not with the Anaconda itself, but being in a region that has a lot of malaria and dengue fever. It is a difficult decision. sharon miller - I love this photograph!!! Wow! Question – Is Olive leaf extract safe for dogs?? Richard (Founder) - Hi Sharon- Which photo? There are 2 in the blog. The kimchi bowl or the Moray eel? I prefer the Moray Eel. Actually I had a print of one hanging in my bathroom. My wife would not allow it anywhere else in the house. We don’t do any animal-testing. So we cannot specifically tell you that it is absolutely safe for dogs. However, in the 18 years producing it and selling the Olive Leaf, people have used it on their dogs and kids and we have never had a report of any adverse reaction. Love Seagate World#!! All the best to you and all of yours! Richard (Founder) - Thanks Jim! We miss Doug. But it was time to try other methods to promote the company. Have a happy holiday season. Clayton A. - You’ve never received a report of adverse reaction in 18 years? That’s quite a claim. From my informed yet outsider understanding of the pharmaceutical industry, during adverse reaction report collection during clinical trials any adverse reactions, whether attributed to the test medicine or other events outside of the medication (e.g. someone getting sick or having a reaction to something they ate), is to be attached to the test medicine as there’s no way to absolutely rule out any contribution it had to the adverse event. Claiming you’ve never received any adverse reports sounds unlikely just from my purely rudimentary understanding of statistics. Perhaps you’ve received an adverse report and attributed the reaction to user error, or any other plausible explanation. That would of course be suppression information, or false advertising depending on one’s viewpoint. You and I both know that Pharma regularly using data suppression tactics and false advertising tactics when bringing products to market. I see no reason any other capitalist business, whether holistic, “natural” or otherwise would be incentivized to operate any differently. To repeat — we have never received a report of an adverse reaction to taking our Seagate Olive Leaf Extract. While it may be interesting to you to find some report on the internet about someone getting sick from some other brand of olive leaf, it does not change our response to you. Most brands of olive leaf extract do not process their own product. They outsource their extract purchasing it from from overseas brokers(a lot comes from China). Most other olive leaf extracts have been processed with alcohol or some other solvents to concentrate or actually attempt to concentrate their oleuropein. There is also a lot of doctoring of the raw material in this industry, mixing in fillers. So the possibility and probability that people are reacting to other brands is quite likely. However, what distinguishes Seagate from almost all other brands of olive leaf extract is that we grow our own olive trees and process our extract in our own factory. We have absolute control over the product that is in our bottle. So you are wrong – “we have never received any adverse report whatsoever” … and that is not by accident. It is a result of a lot of hard work growing and producing our own product ourselves. Claiming the likelihood of suppressing adverse reports, linking such tactics by Big Pharma to the “natural” foods industry and then ultimately to us is a stretch and insulting. Thank you for your question, though you might want to be less accusatory and argumentative until you have gathered all the facts. © 2019 Seagate World|ProPhoto Website by NetRivet, Inc.